Imager is a perl module for manipulating gray, color and rgba format images. It can read various file formats, has lots of filters, a builtin interpretered language for blends, fades and multi-image effects. It has drawing primitives and supports antialiased truetype and postscript fonts. It also has a plugin interface to write plugins in C.
If you're having trouble using giflib with Imager, you probably want the giflib patch which fixes a couple of bugs in giflib. 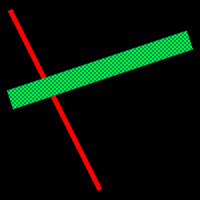 thickline.pl - draw thick lines using the polygon filler (output). I'm also working on Imager::Graph, though currently it only has pie graphs. At least in theory - I never seem to find the time to work on this, though I have done a little work on bar charts. name of font "Arial Bold Italic" vs "arialbi.ttf"
I originally wrote the transform2 function for Imager, and extended the gif support. Simple example code on how to produce animated gifs with Imager. Some examples of how various Imager filters look. I may create a more dynamic wrapper at some point. Right now I'm working on gradient or fountain fill support similar to that provided by tools like the GIMP or Photoshop. I have a basic version going, but I want to add support for most of the GIMPs features, so the caller can load an existing GIMP gradient file. I'm currently extending the current transform2() function to support more general functions by adding jump operators in the low-level register machine, and adding support to the existing compilers to support loops and conditional statements. I'm also planning on changing Imager::Expr::Infix to use a pre-compiled grammar, rather than compiling a grammar with Parse::RecDescent the first time it is used. It may be possible to use Parse::Yapp to do this.